Wine, food and entertainment come together the second weekend of October at the annual Harvest Festival at Treleaven Wines. 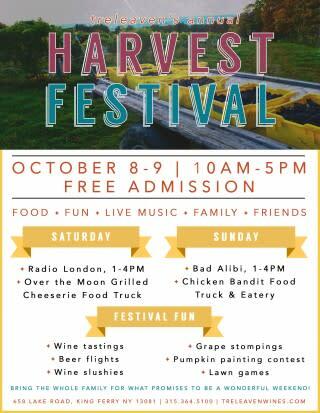 The two-day festival, which will run from Saturday, October 8 through Sunday, October 9, will include numerous activities for young and old including traditional grape stompings, pumpkin painting contests, wine and craft beer, lawn games and live music. "This will be a wonderful way to spend a beautiful fall day with the entire family," Marketing Manager, Michelle Kokot said. "We will have activities for the children, and of course, wine for the adults, not to mention fantastic live music that will have everyone on the dance floor." Entertainment will include Radio London (Saturday) and Bad Alibi (Sunday), with both acts beginning at 1PM. Radio London is one of Ithaca&apos;s best dance bands, playing tunes from the golden age of Top 40 radio. Their music selection draws inspiration from British well-knowns including The Beatles, Rolling Stones and The Searchers. Bad Alibi will be bringing classic rock to the Treleaven stage on Sunday, cranking out tunes that mirrors those of Tom Petty and the Heartbreakers, REO Speedwagon and Bruce Springsteen. After taking part in a traditional grape stomping or painting a pumpkin for our contest, sample a collection of award-winning Treleaven wines including brand new releases, 2014 Meritage and 2015 Dry Riesling. Along with wine, there will also be a selection of domestic beer and local craft beer from breweries such as Cortland Beer Co., Ommegang, Waterstreet Brewery and Bandwagon. Enjoy food menus from local food trucks Over the Moon Grilled Cheeserie on Saturday, and Syracuse mobile eatery, Chicken Bandit Food Truck. "We encourage everyone to wear a sweater and bring a blanket for an afternoon with us," added Kokot. "It&apos;s our final big event of the year so we want to see all the familiar faces and many more new faces join in on the fun!" The event will run from 10AM-5PM each day at 658 Lake Road, King Ferry NY 13081. Head to our Facebook page or www.treleavenwines.com for a full schedule of events, and call 315.364.5100 if you have any questions.